Sometimes your groove is thrown off when you’re dancing or running. So long as you can find the beat of the music it’s pretty easy to get back on task. 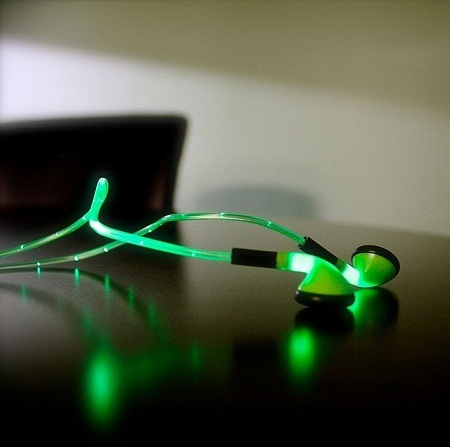 However, another element such as lights that pulse with the song can go a long way to help you stay in the loop. Normally that’s only something you would experience at a concert or night club, but what if you wanted it while on a nighttime run? The IGLO Pulse is a pair of headphones that will illuminate with the beat of the music. Not only would this be an added fun factor, but if you’re biking, running, or just taking a stroll at night, these will help improve your visibility. This fits into any standard 3.5mm jack, and has a built-in microphone for taking calls. You can choose between bright blue or green for the color of the light, and it will cost you close to $30 for the pair. The only possibly challenging aspect of this is how you might be temporarily blinded by such a bright light coming into your field of vision when you move. Looking on the more positive side, untangling this in the dark would be a breeze, as you can easily see where everything goes. Not only that, but bunching this up in your hand when it’s still plugged in would make it easier to see the lock on your door, or where you may have dropped your keys.